The output of the aerosol valve function tester can go up to 200 aerosol cans per minute. The scroll brings the aerosol cans to machine-separation distance. The aerosol cans are taken from the conveyor, served 180° in ready-for-use position, and passed over to the carrousel. The carrousel consists of 16 stations. Each station disposes over an infrared-reflective sensor. In the carrousel , the valves of the dosing aerosol cans are pressed by a mechanical lever-system. This is done in 4 ranges, over fixed curves. Both, first spray-ranges serve to fill-up the valves. In the 3rd and 4th range, the infrared-reflective sensors are activated to measure the spray-jet. The outflow-star takes the dosing aerosol cans out of the carrousel, the defective cans are taken out and ejected, the good-parts are put on the outflow conveyor, in transporting position. The available suction system, extracts the sprayed active substances out of the machine. The valves measured are further in the Peripheric-device ET 200, in the carrousel. They are optically transmitted from the rotating carrousel to the stationary SPS-steering and from here out evaluated. When defects occur or when the emergency-stop switch is actuated , the machine stops immediately and the inflow-block opens only after reaching operating speed. The two ejection chambers serve for separate reception of the aerosol cans to be ejected. In each of the allocated chambers, alternatively the defective cans and on the other hand the cans, who were in the carrousel during the empty running, are ejected. 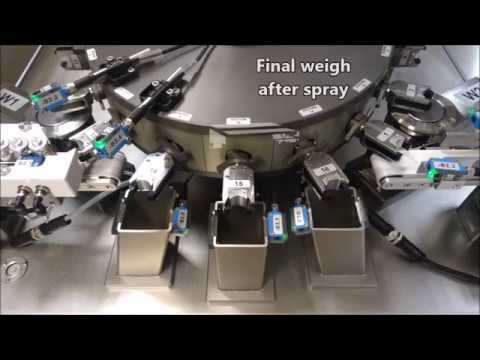 The aerosols, eliminated during empty running can be recuperated into the machine. Infra-red reflective sensors to measure spray. 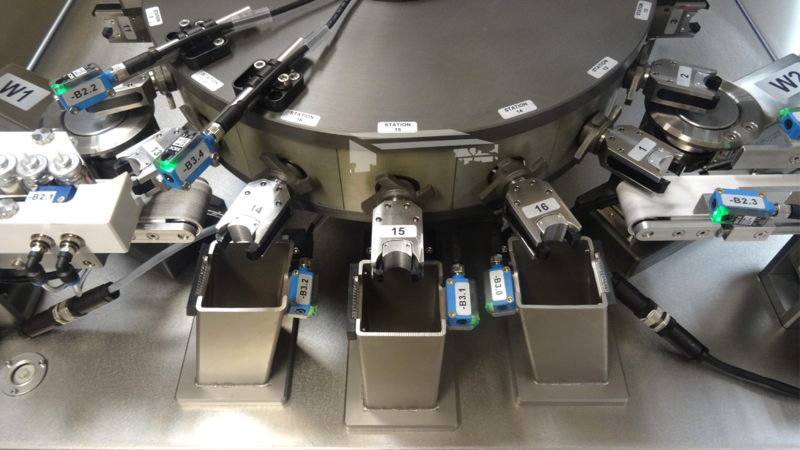 Bautz has recently shipped an Aerosol Valve Function Tester for MDI inhalation aerosols. The customer was looking for a flexible machine to use in Product development. He wanted to be able to set the number of sprays as well as spray duration. Weigh cells were to measure the amount discharged. 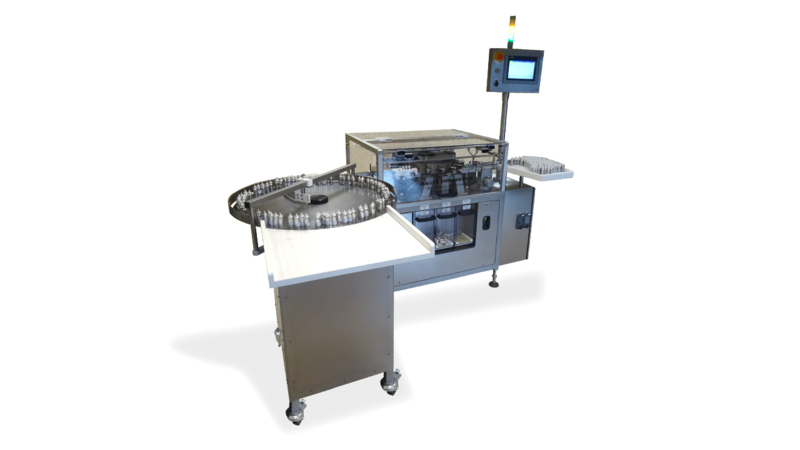 Bautz developed the VFT 60 in response to their customers requirements.